My research interests are largely in the literary culture of the nineteenth- and early twentieth-century periods, especially late-Victorian and Edwardian fiction. I have co-curated the following exhibitions at Palace Green Library: Outrageously Modern!' Avant-garde magazines 1884-1922, Robots! and Books for Boys: Heroism, Adventure & Empire at the Dawn of the First World War. I curated an exhibition of H. G. Wells books and manuscripts for the University of Illinois, Champaign-Urbana, for Wells's 150th birthday in 2016. Summer 2017 will see an exhibition on time travel at Durham's Palace Green Library. Unsettled Accounts: Money and Narrative in the Novels of George Gissing was published by Anthem Press in 2003, the centenary year of Gissing's death. I have also published in The Gissing Journal and in four edited collections; I co-edited, with Christine Huguet, George Gissing and the Woman Question: Convention and Dissent (Ashgate, 2013), and, with Pierre Coustillas, George Gissing's Charles Dickens: A Critical Study. In 2012, OUP published my second monograph Maps of Utopia: H. G. Wells, Modernity and the End of Culture, the first full-length study of H. G. Wells's aesthetics. I have also edited four H. G. Wells novels for Penguin. Until the 2016 issue, I am the editor of The Wellsian, the scholarly journal of the H. G. Wells Society. I have published with Nicholas Saul a collection of essays on literature and Darwin, The Evolution of Literature. I have also completed articles on Victorian best-selling authors Marie Corelli and George du Maurier. I have recently edited Wells's The First Men in the Moon for World's Classics and Evelyn Waugh's Decline and Fall for Oxford University Press's Collected Works of Evelyn Waugh. Current research also includes a monograph on the male bond in fin-de-siècle literature, an interdisciplinary project on time, memory and consciousness in Dickens, and an online edition of the states of The Time Machine. I am happy to supervise work on Victorian, Edwardian and contemporary fiction, on psychoanalysis, the fantastic and the Gothic, on masculinity and narrative theory. I will be on research leave 2017-18. I teach in most areas and periods offered by the Department, from Classical and Biblical Background to the Postwar Period. The largest parts of my teaching commitments are my undergraduate Special topic in Fin-de-Siecle Fiction and Taught MA Module Literary Masculinity at the Fin-de-Siecle. I have supervised or am supervising research students working on the Literature of the Fantastic, H. G. Wells, Decadence, Henry James, Victorian Children's Writing, Censorship and Robert Louis Stevenson. James, Simon J. (2012). Maps of Utopia: H. G. Wells, Modernity and the End of Culture. Oxford: Oxford University Press. James, Simon J. (2003). 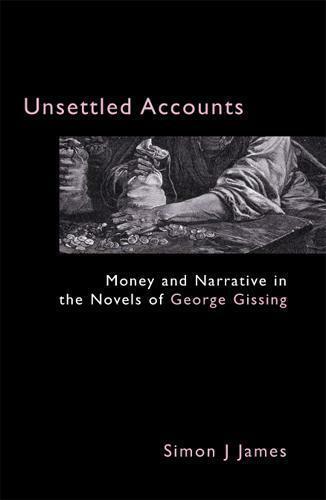 Unsettled Accounts: Money and Narrative in the Novels of George Gissing.. London: Anthem Press. James, Simon J. (2015). Review of Charles Dickens and ‘Boz’ The Birth of the Industrial-Age Author. By Robert L. Patten. Modern Language Review 108(4): 1275-1276. James, Simon J. (2013). Review of Dickens and Victorian Print Cultures. Ed. Robert L. Patten. Dickens Quarterly 30(2): 156-159. James, Simon J. (2010). Review of Keith Williams, H. G. Wells, Modernity and the Movies. Science Fiction Film and TV 3(1). James, Simon J. (2008). Review of Peter Edgerley Firchow, Modern Utopian Fictions. The Wellsian 31: 55-57. James, Simon J. (1998). The Correspondence of H G Wells. The Times Literary Supplement (4962): 14. James, Simon J. (2018). H. G. Wells’s London. In The Palgrave Encyclopedia of Urban Literary Studies. palgrave. 1. James, Simon J. (2016). Charles Dickens, Mental Time-Travelling and Autobiographical Memory. In Unsettling Dickens: Process, Progress and Change. Huguet, Christine & Vita, Paul Paris: Éditions du Sagittaire. 33-54. James, Simon J. (2015). 'Ugly Meanings in Beautiful Things': Reading the First Wilde Trial. In The Persistence of Beauty: Victorians to Moderns. O'Neill, Michael, Sandy, Mark & Wootton, Sarah London Brookfield, Vermont: Pickering and Chatto. 45-58. James, Simon J. (2014). Afterword. In The Time Machine by H. G. Wells; with an Introduction by Greg Bear and a New Afterword by Simon J. James. New York: Penguin. 119-128. James, Simon J. (2014). Q is for Queen: The Reading Nation. In Books for Boys: Literacy, Nation and the First World War. James, Simon J. Durham: Institute of Advanced Study, Durham University. 6-9. James, Simon J. (2013). Island of Memory. In Desert Island. James, Simon J. Institute of Advanced Study. 10-13. James, Simon J. (2011). H. G. Wells's The Time Machine and the End of Literature. In The Evolution of Literature: Legacies of Darwin in European Cultures. James, Simon J. & Saul, Nicholas. Rodopi. 113-123. James, Simon J. (2011). Realism and the Fiction of Modern Life: From Meredith to Forster. In The Reinvention of the British and Irish Novel 1880-1940. Parrinder, Patrick. & Gasiorek, Andrzej. Oxford University Press. 4: 87-102. James, Simon J. (2008). The Mystery of Edwin Drood. In A Companion to Charles Dickens. Paroissien, David. Malden, MA: Blackwell. 444-451. James, Simon J. (2008). Fin-de-Cycle: Romance and the Real in The Wheels of Chance. In H. G. Wells: Interdisciplinary Essays. McLean, Steven. Amersham: Cambridge Scholars Publishing. 34-48. James, Simon J. (2005). 'The Discontents of Everyday Life: Civilization and the Pathology of Masculinity in The Whirlpool'. In George Gissing: Voices of the Unclassed. Ryle, Martin. & Bourne Taylor, Jenny. Aldershot: Ashgate. 93-105. James, Simon J. (2005). In Public: George Gissing, Newspapers and the City. In Gissing and the City: Cultural Crisis and the Making of Books in Late-Victorian England. Spiers, John. London: Palgrave Macmillan. 189-188. James, Simon J. (2004). 'Pip's Counterfeit Money: Forgery and Great Expectations.'. In Fakes and Forgeries. Knight, Peter. & Long, Jonathan. Amersham: Cambridge Scholars Press. 41-49. James, Simon J. (2001). 'Experiments in Realism: How to Read a George Gissing Novel'. In A Garland for Gissing. Bouwe Postmus Amsterdam: Rodopi. pp. 11-21. Simon J. James (2000). 'George Gissing'. 'Demos'. 'In the Year of Jubilee'. 'The Odd Women'. In The Oxford Companion to English Literature. Margaret Drabble. Oxford: Oxford University Press. James, Simon J. (1999). 'Pathological Comsumption: Commodities and the End of Culture in H G Wells' Tono-Bungay'. In Consuming for Pleasure: Selected Essays on Popular Fiction. Julia Hallam & Nickianne Moody. Liverpool: Liverpool John Moores University Press. 44-61. James, Simon J. (2017). The First Men in the Moon. Oxford World's Classics. Oxford: Oxford University Press. James, Simon J. (2014). Books for Boys: Literacy, Nation and the First World War. Insitute of Advanced Study. James, Simon J. (2013). Desert Island. Insitute of Advanced Study. Saul, Nicholas. & James, Simon J. (2011). The Evolution of Literature: Legacies of Darwin in European Cultures. Internationale Forschungen zur Allgemeinen und Vergleichenden Literaturwissenschaft 152. Rodopi. Shapcott, John. (2010). Some Versions of Realism: Arnold Bennett and H. G. Wells. Arnold Bennett Society. Simon J. James (2005). H.G. Wells, The History of Mr Polly. Harmondsworth: Penguin. Simon J. James (2005). H.G. Wells, Kipps. Harmondsworth: Penguin. Simon J. James (2005). H.G. Wells, Love and Mr Lewisham. Harmondsworth: Penguin. Simon J. James (2005). H.G. Wells, The New Machiavelli. Harmondsworth: Penguin. Simon J. James (2004). George Gissing, Charles Dickens: A Critical Study. London: Grayswood. James, Simon J. (2018). Daily bread: food and drink in the Holmes canon. Critical Quarterly 60(3): 5-13. James, Simon J. & Miller, Emma V. (2016). A Body Undressed for Text: Trilby in Parts. Feminist Theory 17(1): 83-105. James, Simon J. (2016). The Worlds of H. G. Wells. Nature 537: 162-164. James, Simon J. (2013). Marie Corelli and the Value of Literary Self-Consciousness: The Sorrows of Satan, Popular Fiction, and the Fin-de-Siècle Canon. Journal of Victorian Culture 18(1): 134-151. James, Simon J. (2012). Witnessing the End of the World: H. G. Wells's Educational Apocalypses. Literature and Theology 26(4): 459-473. James, Simon J. (2011). Research-Led Teaching? The Gissing Journal 47(4): 11-14. James, Simon J. (2011). Teaching Gissing in the Twenty-first Century. The Gissing Journal 47(4): 1-3. James, Simon J. (2008). A Prophet Looking Backwards: H. G. Wells's Curriculum for the Future. English 57(218): 107-124. James, Simon J. (2001). The Truth about Gissing: Reassessing the Literary Friendship of George Gissing and H.G. Wells. The Wellsian 24: 2-21. Simon J. James (1997). Negotiating The Whirlpool. The Gissing Journal 33(2): 15-25. James, Simon J. (2011). Science and Literature. The Grove 17: 33-35. James, S.J. (2010). The Wells Archive at the University of Illinois at Urbana-Champaign. The H. G. Wells Society Newsletter 5(20): 5-7. James, Simon J. (2016). H. G. Wells, Time Traveller: An Online Exhibition. James, Simon J. (2015). Ghosts and Dickens. James, Simon J. (2013). In conversation with Professor Simon James. James, Simon J. (2013). The Idea of a Planned World: H. G. Wells's 'The First Men in the Moon'. youtube podcast. .
Simon J. James & Walker, David. (1993). Sissinghurst.